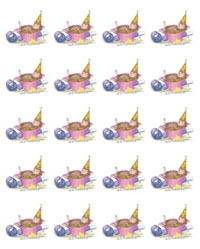 Your Favorite House-Mouse Designs® images as 1.8" x 1.8" square stickers. They are printed on our white peel and stick paper. The sheet has 20 stickers. Stickers peel off and are sticky back. Click on any of the links above to check out our really "Mice" Mouse Pads.